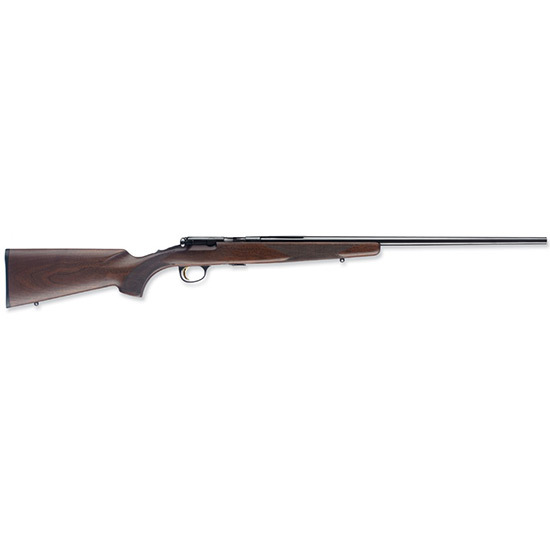 Browning 025175270 T-Bolt Sporter Bolt 17 Hornady Magnum Rimfire (HMR) 22 10+1 Walnut Stock Blued in. The Browning TBolt is an accurate handy and easy to shoot rimfire. Todays TBolt a rifle every bit the equal of the original has several exciting features that put this unique rifle in a class by itself. These modern versions rely on the classic straight pull bolt action design to chamber each cartridge fed from a 10 round rotary box Double Helix magazine. The TBolt s three lever trigger offers a light crisp break and every barrel is free floating. Those who are serious about rimfire accuracy will appreciate the TBolt TargetVarmint model. It features a walnut stock with raised Monte Carlo comb and a heavy varmint barrel.